The relationship of a child with his/her parents is perhaps the most beautiful one on this earth. It defines that child and makes him what they are when they grow up. Basking in the love of both the parents is a blessing but having to choose from either of them is a very traumatic experience. Custody ( ISBN 9788184001549, Published by Random House India) by Manju Kapur is about one such experience. Few writers have explored the complex terrain of Indian family with as much insight & affection - Outlook. Earlier I have read another book by Manju Kapur- Home and have loved her simple, lucid style of writing. I admire the way she deals with very sensitive issues prevalent in Indian households even today. She writes beautiful stories woven around some very usual happenings which most of us tend to ignore. Her stories have a unique this-is-my-story feel to them because of their simplicity. Marriage is considered to be one of the most sacred bonds in this world. But I feel it is one of the most complex too.I truly appreciate the fact that the way we fall in love similarly we fall out of love too. But the thing that perplexes me the most is when a marriage falls apart how can anyone not think about the children involved and drag them amidst the dirty linen washing. This book has no suspense or romance. It is a pure family drama with a couple Mr & Mrs. Kaushik deciding to end their marriage and challenge the custody of their two children. I have witnessed a broken marriage very closely and I always believe instead of making an everyday existence a challenge they should end it amicably. Many times to satisfy their own ego parents tend to use their children as pawns against each other. The children suffer for no fault of theirs. I always wanted to understand what goes on in such people's minds and it was the sole intention behind buying this book. But unfortunately I did not get any answers.I think this question perhaps does not have any answer maybe that is why none of them has ever attempted to demystify this mystery anywhere.It is heartening to see a child go through such a heart breaking experience while at the same time you feel angry at the way parents have dealt with this entire issue. Over all a nerve touching book which leaves you a lot of unanswered questions. Enjoyable, worth a read only to understand why some people behave the way they do. 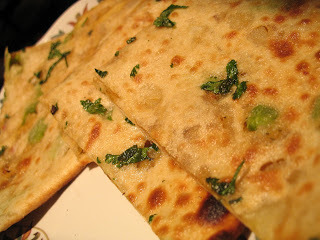 To retain the Indian flavour brought out so beautifully in this book for Me this book is a hot spicy Aloo parantha. Tempts you to eat it, leaves a fiery feeling from your mouth to the stomach! I agree family dramas are more intense than any other genre, but yes a happy ending is something difficult to find in each book. Though if you ask me this one did have a happy end for some of the characters, but for Me it was not one.